Online reservations are not currently used by this restaurant, but you can call (314)241-7799 to see if they will take your reservation. Husband and wife Paul and Wendy Hamilton have had considerable success with their renovation efforts of an historic building at Chouteau Avenue and 21st Street that once was a part of the Schnaider Brewing Co. in the 19th century. After launching a series of winning ventures that includes the Eleven Eleven Mississippi, Vin de Set and PW Pizza restaurants as well as Moulin Events and the Grand Petite Market, the Hamiltons have converted the cellar of their Centennial Malt House in the Lafayette Square neighborhood into the 21st Street Brewers Bar. The title of the bar is in keeping with the Hamiltons’ tradition of naming establishments for their physical locations. “The fact that the 21st Amendment repealed Prohibition just makes it all the more appropriate,” says Paul. The bar, which opened in March 2014, is designed to highlight St. Louis brewers and their products, says Jason Arnold, managing partner and director of operations for Hamilton Hospitality LLC, which includes all of the aforementioned establishments. “My role is to oversee those businesses, so by default I became the beer guy,” he says with a laugh. In addition to the local brewers, Jason says that the 21st Street Brewers Bar carries 50 beers on draft and another 75 or so domestic and international beers available in bottles, plus a select list of Cellared beers. With that broad selection, 21st Street Brewers Bar showcases a distinct local array of beers as well as regional offerings to present patrons with the best craft brews available in the St. Louis market. Open Sunday through Thursday from 4 p.m. to midnight and weekends from 4 p.m. to 1:30 a.m., 21st Street Brewers Bar also has wine by the glass as well as a spirits selection. As for food, “we have beer snacks available at the bar, and we offer full service from the PW Pizza menu as well,” says Jason. With the notorious St. Louis summer heat and humidity just around the corner, a cold, tasty brew from a local craft brewer served in the comfort of the underground 21st Street Brewers Bar is guaranteed to quench the thirst of brewing aficionados in search of something different and distinctive. - In a bowl, Soak the bread crumbs in the tomato juice and set aside. - In a larger bowl combine pork, beef, lamb, dry herbs, onion garlic salt and pepper with the eggs, Worcestershire sauce, cheese and bread crumbs. Mix well with hand for 5 mins. Make sure that everything is mixed well together and incorporated. 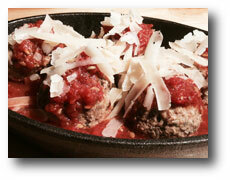 - Once everything is mix portion the meat into 2 ounce balls and place on a baking sheet. When all the meat is portioned place in the over and bake the meat ball for 15-25 mins or until the internal temperature reaches 165 degrees.